Since the early days of international large-scale assessments, an overarching aim has been to use the world as an educational laboratory so countries can learn from one another and develop educational systems further. Cross-sectional comparisons across countries as well as trend studies derive from the assumption that there are comparable groups of students in the respective samples. But neither age-based nor grade-based sampling strategies can achieve balanced samples in terms of both age and schooling. How should such differences in the sample compositions be dealt with? We discuss the comparability of the samples as a function of differences in terms of age and schooling. To improve the comparability of such samples, we developed a correction model that adjusts country scores, which we evaluate here with data from different IEA (International Association for the Evaluation of Educational Achievement) studies on reading at the end of primary school. Our study demonstrates that ignoring differences in age and schooling confounds league tables and hides actual trends. In other words, cross-sectional comparisons across countries as well as trends within countries are affected by differences in the sample composition. The correction model adjusts for such differences and increases the comparability across countries and studies. Researchers who use the data from international comparative studies for secondary analyses should be aware of the limited comparability of the samples. The proposed correction model provides a simple approach to improve comparability and makes the complex information from international comparisons more accessible. International comparative studies on student achievement have been conducted for about half a century. Since the early days of such studies, an overarching aim has been to use the world as an educational laboratory so that countries can learn from one another and develop their educational systems further. The rich body of data that has been collected over the last decades has primarily been used for cross-sectional comparisons. In spite of this, longitudinal comparisons of different trends, which could provide a broad basis to study the effects of certain reforms, have not yet been used. In this context, the current study is part of a large project that aims to link older and more recent studies in order to investigate trends in student achievement over time and across studies. Such data open up the possibility to study the effects of educational reforms and changes in education policies from a long-term perspective. From a technical point of view, two major concerns are the comparability of the tests and the compositions of the samples over time; the present paper elaborates on the latter. Comparable tests mean that we have to use a common metric when we compare the results from different studies, and comparable samples mean that the samples should not differ if we compare them over time or across countries. Meaningful comparisons of study results among countries derive from the assumption that similar groups of students are being compared. Thus, defining the target population is an important step in the design of a study. However, due to different school entry ages across countries, the samples typically cover students that differ either in terms of age, grade, or both. Similar problems stem from changes in the target population definitions over time. If the definitions change, observed differences in student achievement may not reflect actual development but changes in the sample composition. Against this background, the present paper has two aims. First, we discuss the degree of comparability of samples as a function of differences in age and schooling. This is best done with concrete examples from recent and older IEA (International Association for the Evaluation of Educational Achievement) studies that illustrate different sampling strategies. We review research on the effects of age and schooling on student achievement to evaluate the significance of such differences for valid comparisons. We then propose a correction model to adjust for observed differences in terms of age and schooling. This model will be applied to the IEA data in order to discuss practical implications and limitations. “…all students enrolled in the grade that represents four years of schooling, counting from the first year of ISCED Level 1, providing the mean age at the time of testing is at least 9.5 years. For most countries, the target grade should be the fourth grade, or its national equivalent”. (Joncas, 2007). This definition includes the three components of age (at least 9.5 years), grade (fourth grade or equivalent), and curriculum (four years of schooling, ISCED Level 1), and also reflects the great complexity of defining a target population in a way that allows comparisons among countries. The difficulties stem from the fact that the school entry age is not equal across countries. Furthermore, the term school covers qualitative differences across countries because they label educational institutions differently. ISCED Level 1 refers to institutions that give sound basic education in reading and other domains (UNESCO, 1997). In many countries, this is primary school, but in others, preschool or kindergarten curricula cover formal learning in certain domains as well. Despite the complex definition of the target population in PIRLS 2006, the countries’ samples differ dramatically in terms of age. The average age of the fourth graders in Italy, for instance, was 9.7 years, but in Sweden it was 10.9 years (Mullis et al. 2007). This shows that despite complex sample definitions, the sample compositions naturally differ across countries and point out that age and grade differences address diverse concepts. Furthermore, other studies that also addressed student achievement at the end of primary school used different sampling strategies. An early study in this field was the Reading Comprehension Study in 1970, which was part of the very ambitious multicohort Six Subject Survey carried out in 21 countries (Thorndike, 1973; Walker, 1976). The study designers specified the target population at the end of primary school in the following way: “All students aged 10:0–10:11 years at the time of testing” (Postlethwaite, 1974, p. 164). They explain that it was “defined by age rather than grade because age is a uniform attribute from country to country, whereas the meaning of grade varies”. (Peaker, 1975, p. 31). Consequently, as each country’s sample covered students at the same age but from two or more adjacent grades, in international comparisons the countries sampled different grades as well. In Sweden, for example, most students at this age were in grade 3 or 4. In Italy, only a few students were in grade 4, the majority being in grade 5. It is crucial to note that with the country’s sample split between two—or even more—grades, in the lower grade the students are rather old, and in the higher grade they are rather young. That implies that we cannot compare such a sample with one that targets a complete grade (regardless of students’ age). Therefore, Italian and Swedish fourth graders should only be compared with great caution. It should also be mentioned that even if data from multiple grades are available, the respective sample size in the different grades can be very small. The target population was redefined in the Reading Literacy Study from 1991: “All students attending mainstream schools on a full-time basis at the grade level in which most students were ages 9:00–9:11 years” (Elley, 1994, p. 239). The redraft was (partly) a consequence of the experience gained though the previous IEA study because countries expressed concerns that sampling students from multiple grades was a troublesome enterprise (Peaker, 1975). Grade-based sampling makes the data collection easier because entire classrooms can be tested. In most countries, either grade 3 or 4 was tested. From an international perspective, the comparability in terms of age was somewhat reduced because after the grade selection, age was not a relevant criterion anymore. Nevertheless, due to the fact that age was still part of the target population definition, age differences were limited to some extent. In the IEA studies on reading referred to earlier, the target population definitions shifted from an age- to a grade-based strategy so that nowadays the comparability in terms of schooling is valued as being higher. A similar shift can also be observed in other IEA studies on civic education, mathematics, and science (see Joncas, 2008; Zühlke, 2011). In contrast, the Organisation for Economic Co-operation and Development (OECD, 2009) applied an age-based sampling method in the Programme for International Student Assessment (PISA). These differences show that researchers treat comparability in age and schooling differently. Regardless of the respective approach, it is crucial to note that any sampling approach results in certain differences that violate the assumption of having comparable samples. So far we have only elaborated on age and grade differences, but the point of time within a school year when the tests are administered also affects the comparability of the study results. This is problematic if testing takes place early in the school year because the students are younger and have had less learning opportunities in school. In the early Reading Comprehension Study (1970), for instance, the data collection was carried out at the end of the spring term (Hansson, 1975). This is a rather vague description because the end of a school term does not refer to a particular month. In comparison, in the Reading Literacy Study, the tests were administered in the eighth month of the school year (Elley, 1992), which is also vague as schools may not all start at the same time in large countries. Both specifications leave room for interpretation and proved difficult to implement (Rust, 1994). In PIRLS, the test administration was scheduled within a testing period, which was April-June 2001 (Martin et al. 2003) and March-June 2006 (Martin et al. 2007). As the test months of the individual students have been recorded in the IEA data sets since 2001, we have the possibility to evaluate when the tests were actually administered. These records reveal certain differences. Italian students, for example, were tested in May 2001, but Swedish students in March 2001. In Sweden, the 2006 tests were administered in April and May, which is approximately 1½ months later than in 2001. Unfortunately, no records of the test months are available before 2001. A preliminary result of the overview of target population definitions and test months is that the respective samples in large-scale assessment studies differ in terms of age and schooling. In order to answer the question to what degree such differences affect the comparability of the samples, we need information regarding how much age and schooling account for individual differences in student achievement. Such information also helps to evaluate the restrictions that correspond to different sampling approaches and sample compositions. The difference in achievement between two adjacent grades is a measure of what students learn in one year if no special cohort effects occur. The regression discontinuity (RD) approach provides an analytic framework to decompose this difference into the relative effects of age and schooling. In RD analyses, student achievement is regressed on students’ age and grade. 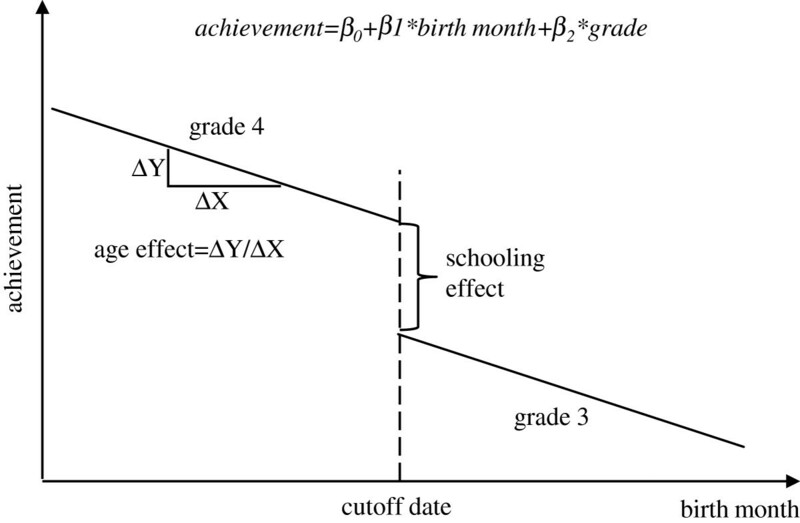 In graphical terms, this approach results in a regression line for achievement on age, which is broken at the cutoff date (see Figure 1). The slope represents the relative effect of age and the jump the schooling effect. Regression discontinuity design: regressing achievement on age and grade. The basic assumption is that close to the cutoff point, students only differ in terms of schooling but not age. However, this assumption does not hold in many countries. Martin et al. (2011) investigate the age distribution in the countries that participate in PIRLS 2006. They show that the age range is 12 months in some countries, but in others it is much larger. This indicates variations in the policies on school entry and grade repetition. In most countries, students’ school entry depends on whether they are born before or after a certain cutoff date. However, this cutoff point can be “fuzzy” so that the age range exceeds 12 months. Fuzzy in this context means that the cutoff point is not sharply delineated and children can deviate from the common cutoff date rule. Such students most likely differ from other children in their age in qualitative criteria such as abilities or school readiness. This causes some children to enter school early or late, thus accelerating or delaying their school careers. However, if such a fuzzy cutoff point applies, we cannot infer the true relation between age and achievement from the observed relation because the youngest students within a grade may have started school earlier or skipped a grade due to their particularly high abilities. On the other hand, the oldest students may have started school late or repeated a grade because of particularly low abilities. This causes the estimates from ordinary least square (OLS) regression to be biased. In methodological terms, the endogeneity problem applies, that is, the dependent variable is correlated with the error term because age is correlated with other predictors of student achievement. Different approaches have been used to overcome bias from such selective age samples. One approach is that researchers try to avoid the endogeneity problem by narrowing the age range. In a series of papers, Cahan and colleagues (Bentin et al. 1991; Cahan & Cohen, 1989; Cahan & Davis, 1987) analyzed the development of basic skills during kindergarten and the first two school grades in Israel. They estimate RD models with OLS regression. In order to overcome the endogeneity problem, students born close to the cutoff date were excluded from the analyses. In fact, the resulting samples only covered students born between February and November. This strategy also eliminates bias from students who repeated (or skipped) a year, though we estimate that the proportion is small in the early grades. According to their age, these students were not supposed to be in the sampled grade. Some bias remains, however, as some students who were born between the cutoff days repeated (or skipped) a year. The analyses reveal a substantial effect of formal learning in school over and above the effect of aging. Obviously enough, the key assumption when identifying unbiased effects of age and grade is that only students born in certain months are affected by the endogeneity problem. In countries where children cannot depart from the common cutoff date, no child has to be excluded. Unfortunately, most countries do not apply strict age-based school enrollment rules rendering this approach ineffective in these countries (Martin et al. 2011). A second strand of research uses knowledge about the selection process that influences the school entry in statistical models. This is typically done within the instrumental variable (IV) regression framework (c.f. Angrist & Krueger, 1991, 2001). The idea is to find a variable (an “instrument”) that is related to an independent, endogenous variable X, but not to the dependent variable Y, apart from by the indirect effect via X. The treatment effect is identified through the part of the variation in X that is triggered by the instrument. With respect to the effect of age on student achievement, this strategy was first proposed by Bedard and Dhuey (2006). Even though this study did not aim to separate the effects of age and grade but only to estimate the effect of school entry age, it is interesting from a methodological standpoint. The basic idea is to distinguish between when a child starts school according to the cutoff date rule (the instrument) and when he or she actually enters school. A two-stage least squares (2SLS) estimator can be used to estimate the effect of age on educational achievement within the IV framework. In the first stage, the selection process is modeled by regressing the actual school entry age on a so-called instrument, which in this case is when the child starts school according to the cutoff date. In the second stage, student achievement is regressed on the fitted (predicted) values from the first stage. Bedard and Dhuey provide estimates from OLS and IV. The observed relation (OLS regression) between age and achievement is positive in some countries and zero or even negative in others. The IV estimates, however, are positive in all countries and, interestingly enough, the corresponding effect sizes are rather similar across countries. What does it mean, then, when OLS estimates are negative but IV estimates positive? We checked the age ranges reported by Martin et al. (2011) for countries where OLS and IV estimates differ. This comparison revealed that large differences correspond with a large age range, which in turn indicates fuzzy cutoff dates. We think that negative OLS estimates of the effect of age on achievement are spurious, that is, they are caused by the fact that in some countries bright children tend to start earlier and poor children later. Note (underneath the figure). Results from mathematics in 8 countries. The upper parts of the bars represent the relative grade effect and the lower parts the age effect. The figure includes the 95% confidence intervals for both effects (source: Luyten (2006) and own calculations). Recently, both OLS and IV estimations have been used to decompose what students learn in one year into the effects of age and grade. Luyten (2006) estimated RD models with OLS regression on TIMSS 1995 data in mathematics and science at the end of primary school. In contrast to most studies that employ grade-based samples, TIMSS 1995 provides a data source where two adjacent grades were sampled at the end of primary school. Luyten used data from grades 3 and 4, and suggests removing misplaced students from analyses if the students were not born within the official cutoff dates. Excluding misplaced students, however, does not account for the problem that some students were born within the official cutoff dates but started school one year earlier or later. Luyten argues that this selection bias will not affect the analyses to a large extent if the rate of misclassified students is very small; he suggests accepting up to 5% misclassified students. This criterion applies to only eight out of 26 TIMSS countries. The result from a series of RD models is that schooling accounts on average for 60.3% of the differences in student achievement between two adjacent grades in mathematics and 53.1% in science; this corresponds to age effects of 39.7% and 46.9%, respectively. The schooling effect represents the effects of a variety of learning opportunities in a school context. The age effect stands for the relative advantages of the elder over their younger fellows because they had more learning opportunities before school starts, a higher mental and physical development during school, or how teachers perceive and treat children at a different age. 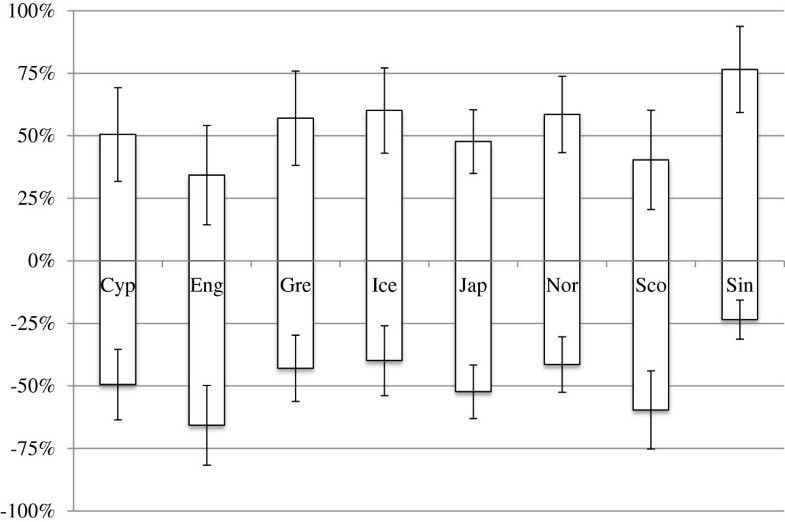 In Figure 2, the bars represent the relative effect of schooling and age in the eight countries (both sum up to 100%). The length of the bar above the x-axis shows the relative effect of grade and the length below the x-axis shows the effect of age. Even though the relative effects of age and schooling differ, the standard errors in Figure 2 are far too large to derive the conclusion that age and schooling have differential effects in the respective countries. The effect of age and grade on student achievement at the end of primary school. In an extension of the OLS analyses, Luyten and Veldkamp (2011) used a two-stage estimation technique in the IV framework to consider the endogeneity problem for countries with less strict cutoff school entry policies and higher rates of misclassified students. Some countries do not apply a cutoff date, or the date varies within the country so that no instrument is available to which to apply IV estimation. However, in the 15 countries where IV estimation was applicable, the analyses reveal that grade (mathematics = 53.5%; science = 47.3%) and age (mathematics = 46.5%; science = 52.7%) account for about the same amount of students’ learning progress in one year. The two studies are also interesting from a methodological standpoint because the results from IV and OLS estimations can be compared. As mentioned before, Luyten (2006) suggests accepting up to 5% misclassified students when applying OLS estimation. A comparison of the results from OLS and IV estimates reveals that they are quite similar, but OLS estimates for the relative effect of age tend to be somewhat smaller and the relative effect of schooling somewhat larger than IV estimates. For the eight countries considered in both studies, the difference was about 10 percent in both domains. There are two possible explanations for the differences: OLS estimates are biased if we ignore the fact that up to 5% of the students are misclassified. On the other hand, students who repeated or skipped a grade may not bias OLS estimates as they are removed, but they can bias IV estimates. Due to the large standard errors and the relatively small number of countries. we should not overinterpret these differences, though. Cliffordson (2010) reports that schooling accounts for roughly twice as much as age in regard to what students learn in one year in mathematics and science in secondary schools in Sweden. She uses Swedish TIMSS 1995 data. Contrary to most participating countries, Sweden sampled not two but three adjacent grades in secondary school. Such data allow the analysis of normal-aged students in grade 7 together with delayed students (at the same age in grade 6) or accelerated school careers (at the same age in grade 8). The findings from a series of RD models with OLS estimation reveal that excluding nonnormal-aged students provides a quite good approximation for the effect of student age. Cliffordson argues that excluding students is reasonable if the proportion of misclassified students is small. With respect to reading, no such extensive databases are available. Sweden, however, extended the international PIRLS sample (grade 4) with an additional grade 3 sample in 2001, while Iceland and Norway added grade 5 samples in 2006. Van Damme et al. (2010) estimated RD models with OLS estimation on the data from the three countries. The proportion of misclassified and excluded students was only about 1 percent in Iceland and Norway and just under 5 percent in Sweden. On average, schooling accounts for about 60% and age differences 40% of what students learn in one year. In comparison to the findings in mathematics and science, this is a somewhat larger effect of age and a smaller effect of schooling. Luyten et al. (2008) used PISA 2000 data from England to estimate the effects of age and schooling on reading achievement in grades 10 and 11. About 2.5% of the students were born out of the official age range and removed from the analyses. They found a relatively small absolute effect of grade, and the effect of age was not even significant. A possible explanation for this finding is that the development of basic reading literacy skills takes place in earlier grades. Table 1 summarizes the relative effects of age and schooling for mathematics, reading, and science at the end of primary school. The table covers the results obtained from some of the studies we referred to in this section. Even though the studies rely on data from different countries, we find it interesting that in primary school, the largest effect of schooling can be observed in mathematics and the largest effect of age in reading. One explanation for this pattern could be that students mainly develop math skills in a formal school context, but children have multiple reading-related learning opportunities out of school. Therefore, the effect of schooling might be smaller in reading than in mathematics or science. In summary, however, both age and schooling have substantial effects on what students learn in one year. Note. Data sources for the columns (1) and (2) is Luyten (2006), for (3) and (4) Luyten & Veldkamp (2011), and for (5) Van Damme et al. (2010). The overall finding of the research review is that any sampling strategy causes differences in the sample composition in terms of age and grade. Additionally, the test month is another source of differences in age and schooling. As both account for a substantial amount of what children learn, differences in age and schooling should not be neglected when making valid comparisons. Classic approaches to avoid such differences are stratification and conditioning. The basic idea of stratification is to compare subsamples within the complete samples. This approach, however, requires substantial overlaps between the countries’ samples in terms of age, grade, and the test month. If countries change the target grade from one study to another, no such overlaps exist. A possible consequence of large differences in the school entry age is that countries cannot be compared, as no overlaps in age are available across countries. Conditioning can be considered as a parametric version of stratification and is a powerful tool because the different samples do not necessarily have to overlap. Conditioning is usually realized by introducing controls into a regression model. But including control variables into a model will only improve the comparability if the functional relation between control and dependent variable is modeled correctly. We already established that the observed relationship between age and achievement can be negative within grades. Observing a negative relationship, however, does not imply that it is actually negative but rather indicates endogeneity. In such a situation, including age may not only fail to improve, but even worsen the comparability. Thus, we suggest dealing with differences in the sample composition by correcting country scores for differences in terms of age and schooling with a mathematical model. In an initial step, we adjust the country scores for differences in terms of age and schooling. Substantial questions can be addressed in another step. We use data from IEA studies to illustrate how to adjust samples for age, grade, and test month differences. This data is particularly suited to illustrate corrections because the different studies employed various target population definitions. Thereby we can demonstrate how to correct for schooling and age differences and show to what extent such corrections affect comparisons. Even though we suggest a rather simple approach, we are only aware of a few similar applications. Rindermann (2007) conducted a secondary analysis of data from different IEA and OECD studies, but he did not distinguish between age, grade, and test months but summarized all differences under the term age. To make the countries’ scores from various studies comparable, he corrected the individual scores by a global factor for age differences. Van Damme et al. (2010) present a model similar to the one we suggest and applied the model to PIRLS 2006 data. The study, however, does not take differences in the test month into account. To illustrate how scores can be adjusted, we use data from the Reading Comprehension Study (RCS) 1970, the Reading Literacy Study (RLS) 1991 and its repetition from 2001, as well as the two first cycles of PIRLS from 2001 and 2006 (Elley, 1994; Martin et al. 2003; Mullis et al. 2003; Mullis et al., 2007; Thorndike, 1973). Fourteen countries/regions participated in the primary school part of the RCS 1970, 27 in RLS 1991, nine in RLS 2001, 35 in PIRLS 2001, and 40 in PIRLS 2006, but only Hungary, Italy, Sweden, and the United States took part in all five studies. For the sake of simplicity we focus our analyses on these four countries. The datasets from the recent studies are available for download from the website of the IEAa. The Center for Comparative Analyses of Educational Achievement (COMPEAT)b provides a database that covers data from older international large-scale studies conducted by the IEA before 1995. We took the RCS 1970 and RLS 1991 datasets from this database. Table 2 presents an overview of the samples in the respective countries and studies in terms of age, grade, and the test months, along with information on the average reading achievement of the samples. In the previous sections, we elaborated on the target population definitions and the composition of the respective samples. All datasets cover information on students’ age in months and grade, but information on the test month is not available before 2001. The reading tests in all studies are text passages and corresponding items which the students respond to after reading. The data from the RCS cover a sum score, which is the number of correct responses on the test items (Thorndike, 1973). The data from RLS and PIRLS cover item response theory scores (Martin, Mullis, Gonzalez, et al., 2003; Mullis et al., 2007). Correspondingly, the scores of the respective studies have different metrics. In order to establish a common metric, we equated the respective tests and transformed the scores on a common metric with a mean of 500 and a standard deviation of 100. Basically, we used the individual raw data on the item level from all five studies and then employed a one-parameter logistic IRT model with an extension for partial credit items to estimate all item parameters in a concurrent calibration (see Kim & Cohen, 2002). It was possible to link all tests due to two Swedish extensions from the international study design. The students from the Swedish RLS 1991 sample took additional test items from the RCS test. A similar extension was made in 2001 to link the tests from the RLS and PIRLS 2001. The linking process is complex and described in detail elsewhere. Consider a simple linear model where the achievement of a student i in a country c and study s is denoted as Y. In model (1), student achievement is a function of differences in terms of Age, Grade, and the TestMonth, while the corresponding country and study specific regression weights are β, γ, and δ. The parameter α is the intercept and ϵ a random residual which covers other sources of variance in Y. Estimates for β, γ and δ can be used to adjust the average reading score in country c and study s for any discrepancies in terms of age and schooling. Therefore, we first aggregate all variables on the country level and set up model (2). The bars indicate aggregated variables and the adjusted average achievement score is denoted as AdjScr. This score is equal to the observed “raw” reading score (RawScr) plus the weighted sum of differences in terms of age and schooling. The Greek letter delta (Δ) indicates differences between a sample and a reference target population. The reference sample can be any target population which is defined in terms of age, grade, and test month. Model (2) is sound from a theoretical perspective, but in practice we often do not have all of the information on β, γ and δ for all countries and studies. We already elaborated on the difficulties in decomposing what students learn into the effects of age and schooling as we need information from multiple grades and such data are rare. Additionally, countries may not employ cutoff dates for the school entrance so that we cannot estimate the parameters within the RD framework. As country and study specific estimates of β, γ and δ may not be available, we suggest that countries should benefit from the information available from other countries. The choosing of appropriate parameters for the correction model and adjusting for age and schooling differences are best described with concrete examples. First, we have to define a reference group which is an ideal fictive target population at a certain age, grade, and test month; for example 120 months (= 10 years) old students in grade 4 tested in Mayc. Policymakers from a certain country may prefer another reference group, which is more similar to their own country. However, the choice of the parameters is of subordinate importance for comparative purposes because defining the reference group affects the level of the adjusted scores but not the adjusted differences across countries. With the new IRT scale (see Table 2, column 7) we can compare the third graders’ results with the fourth graders’ in Hungary and in Sweden in 2001. The differences are 41 and 54 points, respectively. Additionally, Mullis et al. (2003, 2007) report that the fifth graders outperform the fourth graders in Iceland by 39 points and in Norway by 42 points; These differences, however, use another metric, which is the PIRLS scale. We know that the difference between Swedish third and fourth graders is 41 points (see Table 2, column 6) on the PIRLS scale but 54 points on the new IRT scale (see Table 2, column 7). Thus, the variance of the new IRT scale is 54/41 times larger than the variance of the PIRLS scale. We use this ratio to transform the differences between Icelandic and Norwegian grade 4 and 5 students onto the new IRT scale, which gives values of 51 and 55. On the new IRT scale, the average difference between two adjacent grades in Hungary, Iceland, Norway, and Sweden is 41, 51, 55, and 54, respectively, which is on average 50 points. At the end of primary school, age accounts for 60 percent of what students learn in one year and schooling for 40 percent (see the research review above and Table 1), which corresponds to annual age and schooling effects of β = 30 and γ = 20 on the new IRT scale. It is worth recapitulating some critical assumptions for the correction model. First, we need to estimate β and γ; therefore, we have to deal with the endogeneity problem. This can be done within the IV framework if the countries apply certain cutoff rules. If the proportion of misplaced students is small, OLS regression is applicable. The functional relation between age and achievement has to be specified; several researchers found empirical support that linearity is an adequate description (Cliffordson, 2010; Luyten, 2006; Luyten & Veldkamp, 2011). Second, the relation of schooling to achievement might differ during the school year because of the summer vacation (e.g., Alexander et al. 2001; Verachtert et al. 2009). To estimate what students learn in one month, we can divide what student learn in one year in school by 12 months. As noted above, a better alternative is to divide by 10 because students do not attend school for roughly two months during their summer vacations. One is naturally concerned about the variance in what students learn in one year and the relative effects of age and schooling across countries. Thus, we will evaluate how robust or sensitive the correction model is against misspecifications. For this purpose, we employ different configurations of correction weights and compare the adjusted scores. To apply the correction model, we use the average age, grade, and test month in the respective samples and calculate the deviation from the reference group, which we define as a sample with an average age of 10 years, in grade 4, and test administration in May (= month 5). Table 3 lists the deviations of the actual samples from the reference group in columns (1)–(3). We applied the correction model to adjust the raw scores in column (4) with weights of β = 30 and γ = 20 and receive the adjusted values presented in column (5). Note. Own calculation; * G4, Grade 4, G3, Grade 3. Even though the average student’s age is about 10 years across the samples and the dominant grade is fourth, the adjustment in the respective countries affect comparisons in a substantial way. The largest adjustment (+40 points), for instance, occurs for Hungary in RLS 1991 because the sample comprises grade 3 students who are clearly younger than 120 months. In the same study, the U.S. sample has not been adjusted at all because it covers fourth graders with an average age of 120 months. The largest negative adjustment can be seen in the case of Italy in 1970 (−37 points). Assuming that student literacy increases about 50 points on average in one year, the correction model illustrates that comparisons of raw scores would be misleading. We suggest looking at the consequences of the adjustments from two perspectives to get a more systematic impression of the corrections. First, the corrections affect cross-sectional comparisons as they are typically published in league tables or rankings. In 2006, for instance, the raw scores indicate similar levels of reading proficiency in Hungary (510 points), Italy (513), and Sweden (509) and somewhat lower scores in the USA (499). However, even though the countries do not differ in terms of grade, they do differ in age and test month. The adjusted scores reveal considerable differences between the four countries, with adjusted scores ranging from 485 (Sweden) to 525 (Italy) points. Significant changes in the rank order of unadjusted and adjusted scores can also be observed for other cross-sectional comparisons. The corrections also concern trends within countries. The raw scores are hardly comparable over time because the respective countries targeted students at different ages and grades. Through the application of the correction model and the associated adjustments, it is possible to study trends over time, even though the countries sampled different target populations. The adjusted trend lines reveal interesting and diverse patterns (see Figure 3). In Sweden, for instance, the solid trend line for the observed raw scores fluctuates, indicating no clear trend. In comparison, the broken line for the adjusted scores reveals a remarkable decline in reading achievement after 1991. Different patterns can also be observed in the other countries, although the adjustments are small in Italy and the USA after 1970. Unadjusted and adjusted trends in reading achievement. The results from the previous section suggest that comparing samples is misleading if we ignore differences in the sample compositions. This yields the question of how much the choice of the correction weights affects the adjustments. One might not accept global correction weights instead of country-specific ones, if different configurations of correction weights lead to large differences in the adjustments. Therefore, we conducted robustness checks that provide an empirical basis to evaluate whether global weights are an acceptable approximation for individual countries and samples. As unrealistic weights can lead to extreme adjustments, we suggest three realistic configurations. Next to the adjustments described above (β = 30/γ = 20; adjusted score I), we weigh the impact of age and schooling equally (β = 25/γ = 25; adjusted score II) and the impact of schooling more strongly than the impact of age (β = 20/γ = 30; adjusted score III). The three configurations represent the relative effects of age and schooling observed at the end of primary school in reading, mathematics, and science. In other words, age as well as schooling account for 40–60 percent of what students learn. This range is large enough to infer on the robustness of the model. The adjusted values are listed in columns (5)-(7) in Table 3. To illustrate the differences, we present the trend lines for all three adjustments and the raw scores in Figure 4. In Italy and the USA the three configurations of the correction weights result in extremely similar adjusted scores. Some small differences can be observed in Hungary and Sweden, but the trend lines in the two countries parallel each other. This indicates that the observed trends within countries are hardly affected by the choice of the correction weights because such analyses do not focus on the level of achievement but on change. The robustness of the correction model: three configurations of correction weights. We also compared how the adjustments change if we use different configurations of weights for different countries. Therefore, we compare the rank order of the four countries in the five studies to evaluate how much the choice of the correction weights drives the adjusted scores. 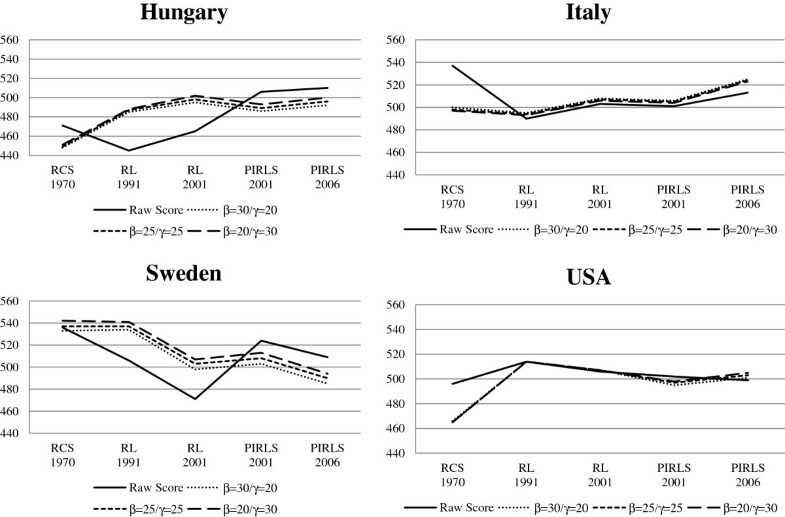 Our analyses support that the rank order is robust except for the Swedish adjusted scores in the RLS from 2001. Here, the adjusted scores I indicates that Sweden outperforms all other countries, whereas following the adjusted scores III would make Sweden a relatively poor-performing country. However, in the RLS 2001, all score indicate that the four countries perform on a quite similar level. Such small differences in the rank order should be interpreted with caution because we deal with estimates, and in terms of effect sizes, such differences are negligible. It is important to note that both cross-sectional comparisons and trend studies are almost always misleading when we consider the unadjusted scores. We think that, all in all, the robustness analyses support the robustness of our correction model against certain changes in the weights for age and schooling. Admittedly, adjustments change the rank order in comparison to the raw scores, but the three configurations of correction weights result in the same ranking (with only one exception). International large-scale studies are widely recognized not only among researchers but also attract the attention of policymakers. But how valid are comparisons? We demonstrated that the samples from different countries and studies cover students at various ages and encompass different amounts of schooling because school does not start at the same age, nor do countries target the same grades. Such differences restrict the comparability of the respective samples, while a number of studies emphasize that neither age nor schooling can be neglected. Against this background, the present paper introduces a simple mathematical correction model where we consider the comparability of the samples as a function of age and schooling. The correction model provides a simple approach to improving the comparability of study results over time and across countries and makes the complex information from international comparisons more accessible. We cannot force countries to harmonize the school entry age, but we can make adjustment to correct for observed differences. The adjusted scores are estimates for the achievement of a comparable reference group at a certain age and with a certain amount of schooling in the respective countries. Some researchers propose correcting for differences in the sample composition for more valid comparisons (Rindermann, 2007; Van Damme et al., 2010), but Martin, Mullis, and Foy (2011) express some concerns regarding adjustments with global correction weights. They observe different patterns in the relation between age and achievement in the respective countries and infer that observing “no simple, consistent relationship (…) implies that any attempt to make a global statistical adjustment to countries’ average achievement in order to account for differences in average age is likely to be misleading”. (p. 25). We were also nervous about global weights but believe that observing no consistent relation between age and achievement simply indicates the endogeneity problem. If studying the effect of age is not amenable in some countries, information obtained in other countries may be used in a correction model. Instead of avoiding corrections we suggest that countries can benefit from each other. Nevertheless, we also worried about assuming that the effect of age and schooling on achievement is equal across countries. Here, we had to weigh the potential lack of accuracy against the option to ignore differences completely. In the language of the correction model, global correction weights will improve the comparability in individual countries if they are better estimates of the real effects of age and schooling than effects of zero. Assuming that age and schooling have no effect at all (=effects of zero) is not plausible and contradictory to the findings from previous research which indicates that both age and schooling have a substantial effect on student achievement. Furthermore, we have shown that the correction model is rather robust against certain misspecifications. It is important to remember that all configurations of adjustments indicate that unadjusted scores are always misleading. Further research is needed on how to address differences in the sample compositions in international comparisons of student achievement. The body of research on reading is particularly limited. To decompose the effects of age and schooling, only results from Iceland, Norway, and Sweden were available. In comparison to other subjects, the analyses indicate that schooling accounts for more in mathematics (approximately 60%) and science (50%) than in reading (40%). Even if this seems to be reasonable, further empirical studies would provide additional empirical knowledge to reinforce the choice of correction weights we suggest in this paper. It would also be interesting to combine different strategies to overcome the endogeneity problem. Instrumental variable estimation is a promising approach to tackle the problems associated with early or late school entry ages. It seems pertinent to consider combining this approach with the removal of students that repeated or skipped a grade, if such information is available. Furthermore, our correction model is flexible enough to be applied in other domains and at different ages and grades. It would be interesting to evaluate how different sampling strategies affect the comparability. At the end of secondary school, for instance, TIMSS samples eighth graders while PISA samples 15-year-olds. The very limited research body on secondary school achievement indicates that the effect of schooling is stronger than the effect of age (Cliffordson, 2010; Luyten et al., 2008). Even though the existing research is far too limited for any definite conclusions, we may construct the hypothesis that grade-based sampling strategies result in more comparable samples when we compare student achievement across countries. The correction model provides a framework to address this question empirically. Finally, we would like to emphasize the fact that the proposed corrections are merely a starting point for substantial analyses and inferences. Sampling is extremely complicated as is dealing with observed differences. In this context, our correction model may be used to provide additional information for policymakers and researchers, thereby simplifying the access to international large-scale assessments. cDefining the test month is important because we have no recorded information on the test month in 1970 and 1991. Note that May was the dominant test month in 2001, and according to Martin et al. (Mullis et al. 2003, p. 10), “the 2001 data collection was scheduled in each country for the same time of year, as in 1991”. Using May as a reference seems to be a good choice. RS analyzed the data and wrote the manuscript. MR and WB contributed with the comments to the manuscript. All authors read and approved the manuscript.